A giant of horseracing, dwarfed only by his own reputation and personality. Uses a trademark ‘flying dismount’ in the winner’s enclosure. 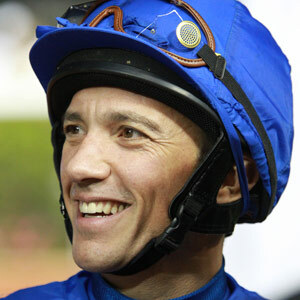 Champion jockey in 1994, 1995 and 2004, Dettori has won virtually every major international race – although it took him 15 attempts to triumph in the Derby, on Authorized in 2007. He began his career with trainer Luca Cumani, becoming the first apprentice to ride 100 winners since Lester Piggott. Famously, he won all seven races on a single day at Ascot in 1996 – a feat remembered as “The Magnificent Seven”. Dettori escaped with a fractured ankle from a light-aircraft crash in 2000 which killed the pilot. Awarded the MBE in 2000. His father Gianfranco was a top Italian jockey. An avid Arsenal fan. Get your hands on his mobile phone and you’ll discover contacts like David Beckham and Ronnie Wood. He was the ambassador for the QIPCO British Champions Series in 2011 and 2012 and in the inaugural year, 2011, he finished second in the Jockey of the Series table with five winners, one behind Tom Queally, who had the help of Frankel. He was banned from race riding for six months in December 2012 after testing positive to a prohibited substance while riding in France three months earlier. He took advantage of this time off to enter the reality TV show, Celebrity Big Brother, in January 2013. He was retained by Sheikh Mohammed’s Godolphin operation for 18 years as their number one rider, but that relationship ended in October 2012. Dettori returned to the saddle after his ban at Epsom on May 31, 2013, now riding as the retained jockey for Sheikh Joaan Bin Hamad Al Thani and had two near misses in big races, when second in France on Olympic Glory in the Prix Jacques Le Marois and second on Shea Shea in the Coolmore Nunthorpe Stakes. However, he finally got his first Group 1 victory in September when bringing the Criquette Head-trained Treve home in front in the Prix Vermeille at Longchamp. It then all went wrong again for Dettori when he broke his ankle in Arc week and as a result missed the ride on Treve, who bolted up in Europe’s richest race. He also missed the ride on Olympic Glory, winner of Europe’s richest mile race, the Queen Elizabeth II Stakes, on QIPCO British Champions Day. He returned to the saddle on 22 January 2014 and rode two winners at Lingfield before striking in the QIPCO British Champions Series on Olympic Glory in the JLT Lockinge Stakes at Newbury, but Frankie had to wait until the Investec Derby 2015 for his ultimate redemption as he partnered the brilliant Golden Horn for trainer John Gosden to an emotional victory. It didn’t take Dettori long to notch his second victory in the 2015 QIPCO British Champions Series as, sharp on the heels of his Derby success, the charismatic Dettori steered Wesley Ward’s US raider Undrafted to victory in the Diamond Jubilee Stakes at Royal Ascot. Knowing his mount was a fast-finisher, he produced the speedster with a fine finishing burst down the centre of the track to deny fellow international star Brazen Beau in the final 100yds. Golden Horn provided Dettori with his third victory in the 2015 Series in the Coral-Eclipse. The John Gosden-trained colt led for virtually the entire race and forged well clear of The Grey Gatsby inside the final furlong. Dettori only narrowly missed out on extending his fine British Champions Series record as Golden Horn was narrowly touched off by 50/1 outsider Arabian Queen in the Juddmonte International Stakes at York’s Ebor Meeting. However, he did not have to wait long until he was back in the winner’s enclosure as he won the Weatherbys Hamilton Lonsdale Cup later in the week aboard Max Dynamite. He almost carried on the winning thread when partnering Clondaw Warrior, another Willie Mullins stayer, to a fast-finishing second behind Pallasator in the Doncaster Cup. A fifth Series win came in the opener on British Champions Day as Frankie partnered John Gosden’s Flying Officer to victory in the QIPCO British Champions Long Distance Cup. He almost notched a second win on the day when Journey was narrowly out-pointed by St Leger heroine Simple Verse in the Fillies & Mares race while he also steered Danzeno into third place in the Sprint. He struck in the opening race of the 2016 QIPCO British Champions Series when steering Galileo Gold to victory in the QIPCO 2000 Guineas, and partnered the same horse to victory in the St James’s Palace Stakes at Royal Ascot. In between, he finished second aboard Architecture in the Investec Oaks. He also won on Journey on Champions Day. Dettori opened his account in 2017 aboard Enable, for John Gosden, in the Investec Oaks and also guided her to victory in two other Series races – the King George and Queen Elizabeth Stakes (sponsored by QIPCO) and Darley Yorkshire Oaks. Cracksman gave him a first victory in the QIPCO Champions Stakes and he also struck aboard Persuasive in the Queen Elizabeth II Stakes. He has already chalked up five wins in the 2018 Series, three of them aboard superb stayer Stradivarius.